I accept custom orders! Click here for more information. Hand dyed SW Merino DK yarn for your most beautiful knitting and crocheting projects. This kettle dyed, semi-solid yarn will give your creations the tonal, complex depth of color that only high-quality, artisan yarn can. Glad Hand is a confident, yet sophisticated medium orange, with lighter and darker concentrations of color gently shifting throughout. This yarn base is round, dense, and soft, and may be machine washed - however I always recommend hand washing your precious hand-crafted goods! The Bucket Dye Studio is smoke-free and pet-free. The Bucket Office is smoke-free but housed within a cat-friendly environment. I do my best to photograph my items in a manner which most accurately describes them, but due to variances in monitors, colors may appear slightly different from one to another. I happily accept Paypal of all kinds as well as Etsy Gift Cards and Etsy Direct Checkout. I expect to receive payment within 24 hours; if there is a problem that arises during that time, please let me know. I reserve the right to cancel your purchase and relist the item on the second day. I ship USPS First Class Mail with a tracking number. Rest assured that I will package your little beauty in a manner that protects it from whatever the environment decides to throw at it. I can't guarantee that I know what the mail might throw at it however, so if you would like insurance please let me know PRIOR to paying your invoice. Any items that exceed the weight limit for First Class will be shipped Priority Mail. Priority Mail is also available as a shipping upgrade if you so desire ~ again, please let me know you would like the expedited shipping PRIOR to paying. INTERNATIONAL CUSTOMERS - I ship USPS First Class International (Please note that there is NO tracking available for this). Insurance and/or expedited shipping is an option that is available to you at an elevated cost, please let me know PRIOR to paying your invoice if you would like to explore these options. I want you to enjoy what you buy! If you are not happy with what you purchase, please let me know. I will accept returns and offer refunds on items that have been purchased (notify me within 3 days of delivery and return items within 7 days of delivery), so long as they are in their original condition ~ free of odors, stains, pet hair, and in an uncaked form (applying to yarn). I will refund you the price of the item, minus shipping costs. 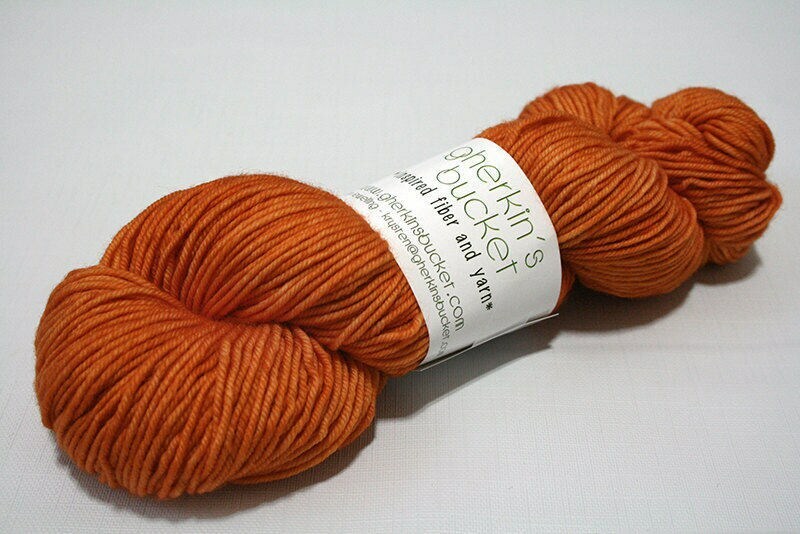 Please visit my website for a custom order: www.GherkinsBucket.com and to view more colors and available yarn & fiber bases. To fulfill your order, you must provide me with certain information (which you authorized Etsy to provide to me), such as your name, email address, postal address, payment information, and the details of the product that you’re ordering. You may also choose to provide me with additional personal information (for a custom orders, for example), if you contact me directly. For purposes of EU data protection law, I am the data controller of your personal information. If you have any questions or concerns, you may contact me at gherkinsbucket 'at' gmail 'dot' com.